HIGH Playing as the villain instead of the hero. WTF Who put all this story in a platformer!? ‘Jack of all trades, master of none’ is a fitting description for the run-and-gun platformer Nefarious. Players take on the role of Crow, an evil mastermind determined to build the ultimate death-ray. The only problem? He has no power source. However, it’s soon brought to his attention that princesses will power his doomsday device, so he goes in search of royalty to kidnap. The story starts off strong but quickly becomes convoluted, primarily from the absurd amount of backstory that’s heaped upon the player. It seems as if every supporting character has something to tell Crow — his henchmen, the captured princesses, the wannabe heroes, and even some of Crow’s fellow supervillians deliver dialogue. There’s information about Crow’s past, his history with the different heroes and princesses, and even a section that provides background on Crow’s family tree. This information is often lengthy, and when it’s delivered during hectic battle scenes, it’s difficult to focus on the dialogue and action simultaneously. I found myself skipping most of the narrative — this is a platformer, I don’t need to know everyone’s life story! This thorough record of events takes Crow through cartoon cities, snowscapes, and lava fields. Enemies encountered (or maybe these are the good guys?) are defeated by punching or launching them offscreen with a well-aimed grenade. Crow has a near-unlimited supply of ammunition, though he’ll need to recharge the explosives if he launches too many in quick succession. Controls are decent, though aiming grenades can be a fiddly process when the action becomes intense. 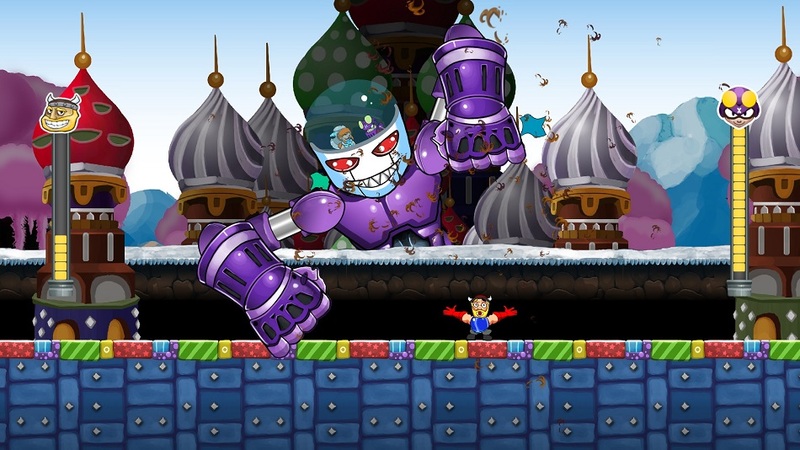 At the end of each stage, Crow commandeers a gigantic robot to squash the hero trying to rescue each princess — instead of trying to tear down these monstrosities, players get to become these larger-than-life bosses! I got to pilot a Dr. Robotnik-like floating orb while swinging a giant wrecking ball at a would be hero. In another level Crow jumped into a screen-filling robot as I attempted to punch the hero running back-and-forth on screen. 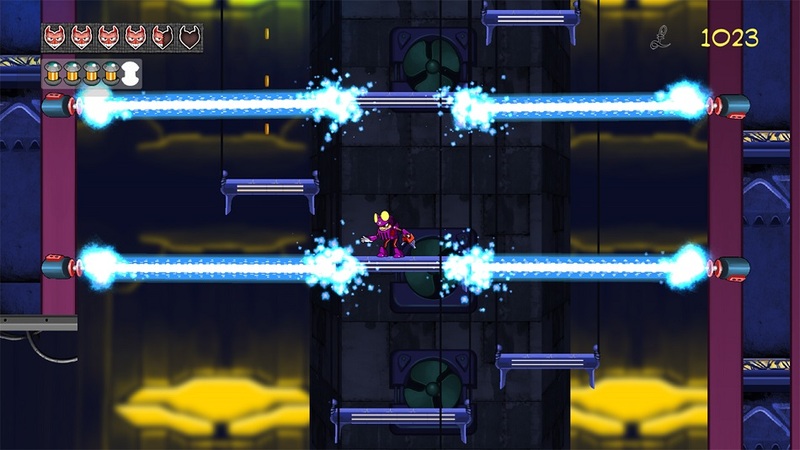 Controlling the robots during boss battles has unique mechanics that create a slight learning curve, but overall these events are some of the highlights of Nefarious. 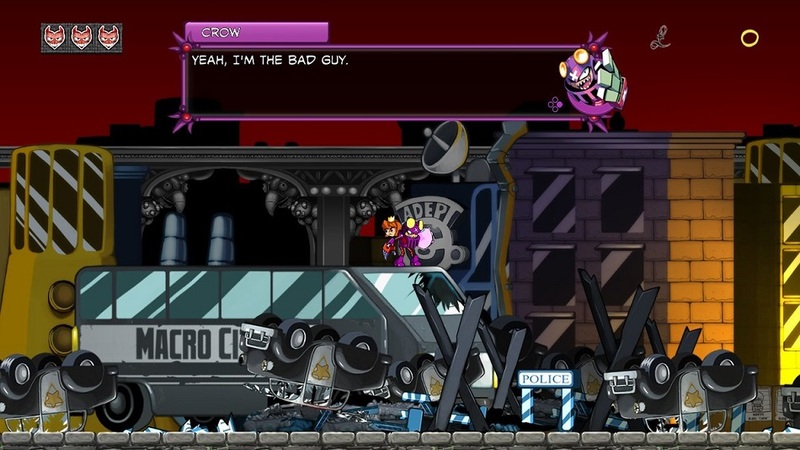 Despite the core of Nefarious being a run-and-gun platformer, there’s variety aplenty — that said, each new twist often left me feeling unsatisfied. There’s an RPG-lite boss battle that came out of the blue and was only used once. Another section provided unlimited grenades and became more like a ‘shmup’ section, making me wish Crow had the ability throughout the game. Then Crow rides a horse-like creature, chasing down a train in a forced-scrolling stage that suffers from poor jumping and dodging. There’s even a dating show level where players need to pick responses. There’s so much randomness within the game, but the underlying issue is that each section is just okay at what it does — too little is fleshed-out and polished. These diversions feel tacked on to the run-and-gun platformer, used once, then quickly forgotten. 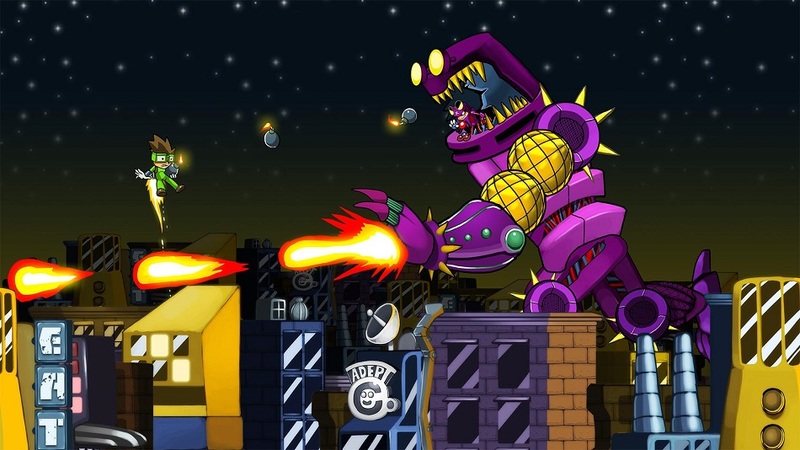 Moreover, Nefarious allows players to upgrade their health, ammo, and attack powers aboard Crow’s flying battle fortress with money earned in levels. Again, there are plenty of variety and options here, but like the one-off sections, this aspect feels like it was added in without much thought as to how it might integrate with the overall experience. I completed most of the game with very few upgrades — I increased my health and ammo once each — but I’m not even sure the enhancements I made were necessary to see the credits roll. Disclosures: This game is developed by StarBlade and published by Digerati. 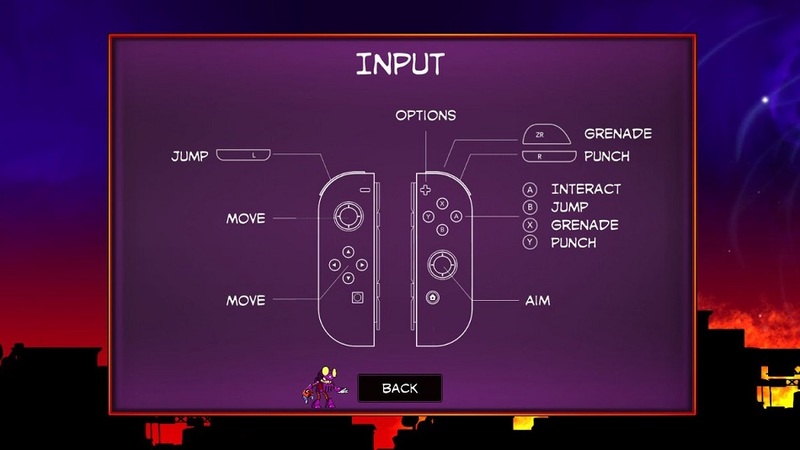 It is currently available on Nintendo Switch, Xbox One, and PlayStation 4. This copy of the game was obtained via publisher and reviewed on the Switch. Approximately 4 hours of play were devoted to the single-player mode, and the game was completed. There are no multiplayer modes. Parents: According to the ESRB, this game is rated E10+ and contains Mild Violence. Parents should feel safe allowing most younger gamers to play this game. The main character punches and throws grenades at this enemies, but when defeated enemies fly off screen. No blood here. Deaf & Hard of Hearing Gamers: Most of the game is fully subtitled. Dialogue is delivered through text, with each character’s name and small picture appearing when they talk. However, the introduction is through voice only, with no subtitles. Players do not need any of this information to complete the game but will miss out on part of the story. This game is not fully accessible. Great Review, Lol. Even though I would never buy a game like this, it was an enjoyable read. Thanks for reading! Glad you enjoyed the review.